One of the most difficult things to face as a composer is having to compromise for the instruments which are available. As I’m currently composing my percussion concerto, there are several gadgets and instruments I’d like to include; most of which are standard percussion instruments. But, due to venue space, and the lack of availability, I have to be creative and improvise around the adjustments. Scholarly research has its ups and downs, and composing musical works that celebrate ancient history is no easy task. Researching the life of Sakanoue No Tamuramara on-line, I’ve come across several racist remarks denying his ethnicity as a black man. In fact, I’ve been repeatedly ignored in my queries by the East Asian Studies Department at Kansas University. So, once again people, if you want to know something, find it yourself! My personal research has located in excess of thirty books, journals, and newspaper articles pertaining to my subject at hand; with references dating back as far as the late nineteenth century. That’s damn impressive! So, I’ve gathered enough historical facts from Japanese, European, and American historians and anthropologists to ground myself as I compose. Unofficially, I’m an ethnomusicologist, and I find it necessary to thoroughly research whatever or whomever it is that I plan to compose a new musical work regarding. I’m excited that I have acquired the artistic services of Mr. Steve Lambert, who will create an original pencil/charcoal work of art to accompany the music. Also, the Japanese Council of Greater Kansas City has included the coming November concert premier on their calendar. Am I nervous? Am I doing too much? No! It’s the duty of an artist or scholar to educate through their medium. If I am unable to educate through my work, than what I do is useless and should have no residence in the furtherance of humanity. 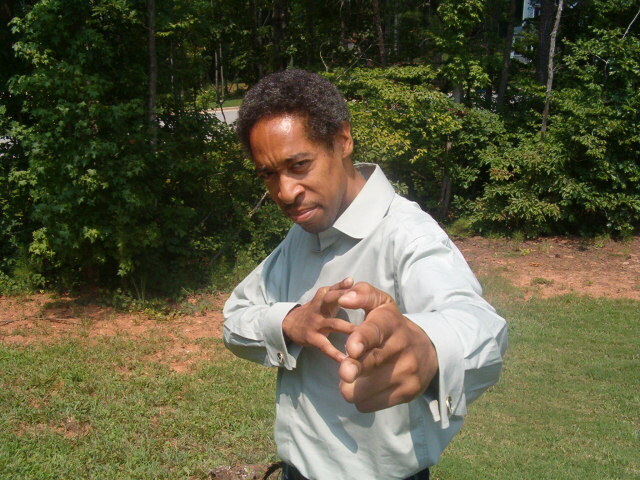 Although my career in music spans over twenty-five years, my double life as a martial artist spans over thirty years. My training in Koga-ryu Ninjutsu and Genbukan Ninpo Bugei/Kokusai Jujutsu Renmei keep me on a straight path; seeing a mission through to its end, not wavering. As I compose, the task is hardly easy. I do not have the freedom to write for indigenous Japanese instruments, neither a plethora of similar sounding instruments that would be ideal. I am limited to the instrumentation of a double woodwind quintet with a solo percussionist. My ability to improvise in such a situation is pertinent. Therefore, I call upon vocal techniques from the ensemble, along with the percussionist’s existing setup (with a few additional items). Yes, it’s fun. The process keeps my mind exploring new ways to voice certain musical ideas. But, something that is always at the fore with my music is that I never want to write anything that goes over peoples’ heads. The listening audience should be able to enjoy the music, and the music should be fashioned in such a way that it engages the listener’s imagination, creating a visual scenario in their mind…….almost like a movie. In other words, I don’t allow academia to interfere with my creative process. That’s another topic of its own at another time in the near future. As for right now, well, back to the lab I go! KANSAS CITY, Mo. (AP) — Starting as a teenager, Kerwin Young helped craft the sound of Public Enemy, which recently became only the fourth hip-hop group inducted into the Rock and Roll Hall of Fame. Now the 43-year-old is honing his skills composing orchestral music and shaking up the staid world of academia in the process. With his hip-hop background, the New York native doesn’t fit the mold at the University of Missouri-Kansas City Conservatory of Music and Dance — an institution he was attracted to, in part, because the school’s professors include Chinese-born composer Chen Yi, and her Pulitzer Prize winning composer husband, Zhou Long. Young finds himself drawn to non-Western music. While Young already knew how to compose orchestral scores when he arrived five years ago, his training had come largely from working as a disc jockey, producing hip-hop and poring through books. That hands-on, figure-it-out-on-your-own instruction was sufficient at first. But with the arrival of gangster rap, Young backed away from hip-hop, saying the new artists were “killing the type of rap music that had been created up until that point.” Some of his music was used in TV and film, but to achieve his dream of writing the musical scores for an action blockbuster he needed more formal schooling. Young’s nontraditional musical background was immediately apparent when he applied to the Kansas City conservatory. First off, he turned in letters of recommendation from Public Enemy co-founder Chuck D. and Eric Sadler of the Bomb Squad. Then there were the auditions. Young had quit the alto sax after eighth grade, wanting to play current music, not the John Philip Sousa marches his band teacher doled out. While he’d picked up a few instruments since then, he didn’t know the technical nuances that come from playing since early childhood. But the self-taught composer’s scores so impressed faculty that the university offered him a spot. Paul Rudy, one of Young’s professors, said the scores were what you’d expect from a graduate student. Still, it was no easy road. Instead of making him focus on a single instrument, the school tried something new, letting Young enroll in classes typically offered to students training to be music teachers. The methods classes teach students a little bit about a range of instruments, a kind of training that Rudy said makes a lot of sense for aspiring composers. Now, that option is available to all composition students. The composition program also has started working with students who want to study the computer as an instrument and rethought the audition requirement. Composition students still audition but mostly so the university knows where to place them. Young initially didn’t plan to stay long, just a month to study orchestration, but now he’s pursuing his master’s degree — taking out student loans to pay for it — after earning a bachelor’s degree last year. Along the way, he’s heard the Kansas City Symphony bring his work to life during a special session where they sight read the work of student composers. For his compositions, he draws from his exposure to the pop world, with his work more melodic than many of his peers. He’s even learned to compose for Chinese instruments. Rudy acknowledged that all the change Young has brought has been uncomfortable for some people. The official piano reduction of my bass concerto, Inescapable, is now complete! It always amazes me how errors in the full score are never made apparent until one begins to break it down. But, just as with all revisions, all notation errors were corrected. This work should go a long way. Well, I’m off to the Nelson-Atkins Museum for some summertime inspiration as I compose Greg Haynes’ Percussion Concerto. The work is based on the life of Sakanouye No Tamuramaro.